My dream bubble quickly popped but I was so enamored with this image of elegant potatoes, I made just this part of that whole fantasy. Boiled often sounds boring so I find myself steering away from that cooking method, but here, these are boiled, and simple but not boring. 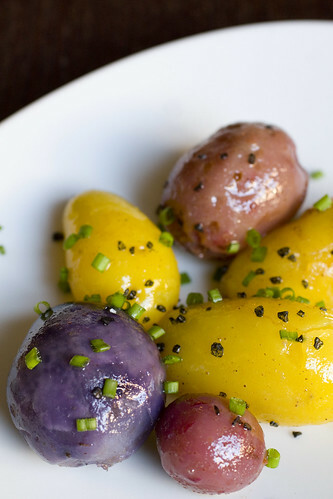 Once boiled, the skins of potatoes are easily peeled, and why not show off these beautiful potatoes in the shapes and colors that nature intended. There is enough variation for it’s own intrigue, like a set of pebbles by the lake. Just a little butter gives them a glossy sheen. I threw on some chives and black sea salt for even more color, but feel free to try different herbs and salts. This is a pretty blank (but not boring!) canvas. 1. Bring a pot of salted water to a boil. Add potatoes and simmer for 10 to 15 minutes, or until fork tender. 2. Drain potatoes and rinse briefly with cold water. You don’t want to cool the potatoes completely, just enough to handle them. Peel potato skins (should be pretty easy). Tip: Potatoes are easier to peel when they are still warm. If you are doing a large batch, don’t cool all the potatoes at once. Leave half in the hot water while you start peeling the first half. Then, drain and peel the rest. 3. Melt butter in a pan on medium heat. Toss potatoes in to coat. Put potatoes in a serving bowl or plate and sprinkle with salt and chives. posted by jessica	at 10:25 AM	Filed under French, Recipes. You can follow any responses to this entry through the RSS 2.0 feed. Both comments and pings are currently closed. 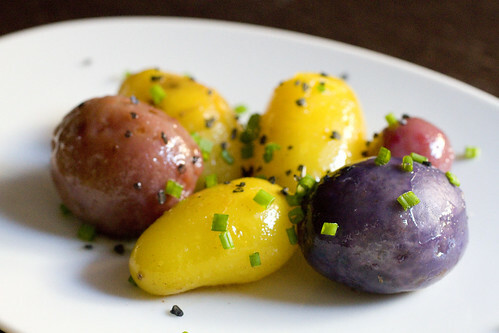 These are awesome pictures, such vibrant colors of these baby potatoes! I want to grab them off the screen! I love these colors. They must be as tantalizing to eat as they are to see. You know, these look wonderful, but I never see stuff like this at my local market. I’m going to the organic farm this week, so maybe I’ll be lucky. The potatoes look great! What a great twist on a fairly simple and classic dish. The colors must look beautiful on your table. I’ll have to pick some up. These are gorgeous! I am so jealous that you can get these beautiful potatoes at this time of year; I have to wait for our farmer’s market to open up again. As much as I love color, you know I adore these potatoes. They would be equally lovable with olive oil at room temp. You know I don’t know I don’t use chives as much as I should. That little smattering looks like confetti. I love it. Looks beautiful! I’m a total potato fan. 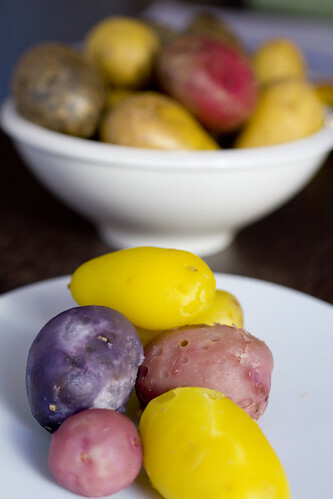 What are those beautiful, saffron-yellow potatoes?? They can’t be yukon gold! Usually, it may just be (re boiling = boring). But, I love boiled potatoes! Stella, Katie and Grace, I’m kind of surprised these are not as available by you. I got these at the farmer’s market but I’ve seen them in BJ’s too. Hope you find them. I just love the little variety. Laura, I’m not sure what the varieties are. It was just a mixed bag. I believe there were four kinds though: a purple, a red, and two yellow/brown, one with smoother skin, one with rougher. TS, thanks. I need it. Oh my gosh, fantastic! These look like Easter eggs, they are beautiful! Oh how beautiful! After recently visiting Ireland, I have learned that our boring ol’ russets “don’t taste of a ting anyhow.”Real spuds are a beautiful thing. Potatoes and carrots are probably the prettiest and most colorful types of vegetables. They look great on a plate in a rainbow of shades. What gorgeous colors! Not boring at all. Naturally beautiful and delicious :).